This ceremony was a gift given to the people through a dream that I had over 18 years ago and took 5 for it to bare fruit, we are currently in our 13th year of fulfilling the vision. The dance was shown to me as a ceremony of inclusion. In the dream I was shown that the old ones would return to ceremony, it was not until a couple of years later that I fully understood this part of the dream. I had become a little despondent and wondered when all the elders were going to start coming like I had seen in the dream, then It came to me, the realization that the spirit of our ancestors were there dancing among us all along. Because the people had become so disconnected from spirit they had forgotten how to see things spiritually as was the case in my interpreting some of the details in the dream. ﻿It has taken a lot of work to take that which I had seen physically and interpret it spiritually as my ancestors did so easily, so long ago. In the dream I was shown a circular arbor built of cedar poles, the drum which represents the heartbeat of Mother Earth was in the middle, and the people stood all around it’s outer edge dancing and praying, looking to the skies for guidance, help and healing. Inclusive means that regardless of your race, religion or physical limitations all were welcomed into this space to pray, dance and receive the teachings of how to live a good life…This is where the peace in your heart comes from, the knowing your living a good life, a life filled with purpose according to the Creators vision. ﻿The dream showed me many things, but never had an ending which has led me to understand that in doing so the human would always need to ask spirit for guidance, to show us what we need in our lives as only spirit knows best… That is the purpose of the sweat lodge the opening evening of the ceremony is to get direction for what we are to learn over the next four days. Equipped with this new knowledge we can return to our families and communities renewed to help them heal and grow. It all begins on Thursday evening with a sweat followed by opening feast. Note - Those fasting will begin doing so the next morning. The following 4 days Friday - Monday start with wipe down sweats 7 rocks, 4 songs, women first followed by the men.﻿..Upon finishing your sweat people need to dress and prepare for entry into the dance arbor. Also this break provides people the opportunity to make prayer ties. and the arbor is open to that and just a peaceful place for everyone to rest, so please be respectful of that space and time. If your unfamiliar with how prayer ties are constructed and their purpose, please see our page titled "Making Prayer Ties" or ask, and others will be glad to help. On the second day, (Saturday evening) after dancing is completed for the day there will be a fresh fruit and vegetable feast for those who are fasting...This is not intended to relieve your hunger and thirst but to further help in the cleansing process. The final day will end early, midday with a feast and allow people ample time to take their tents down and head home at a decent hour. Also if you're planning a give away let me know ahead of time so we can provide a time to do that. More about (what is the give away) on that page. Women still experiencing (Moon time) please see page "Moon time" and all everything related will be covered there. If you still have questions please contact us before hand. 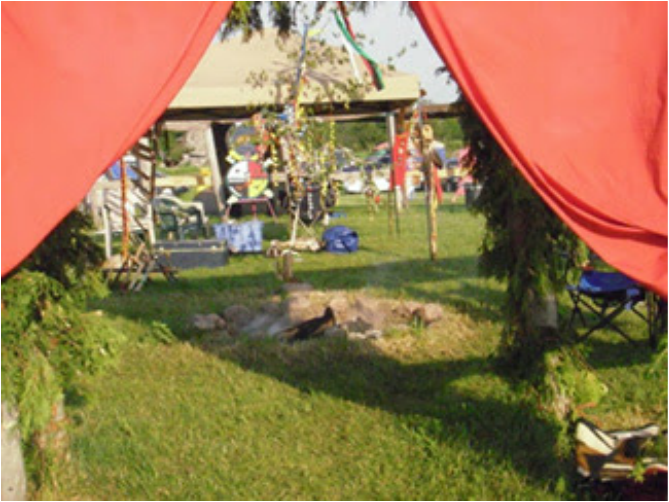 You will need tobacco for offerings, (sweat lodge, fire keepers, prayer ties etc. Some people will be fasting the entire 4 days of the ceremony, this is encouraged but not mandatory. Signage will be posted to keep food, drink and electronics out of ceremony area...Your cell phones are allowed and can be used outside the ceremony area and in the case of use as an alarm clock. ​A side from medications taken for health issues no other drugs or alcohol allowed. Rough camping on site, no electrical hook ups...Porta potties on site. There is at least 2 meals a day provided for those not fasting, a small lunch and a nice dinner. Click the video below and make plans to come dance the dance of "peace in your heart".